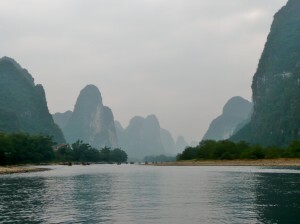 A trip on the River Li today, where we met a lovely Spanish couple, Ibone & John, before being told we were not allowed on the boat with them as we had different destinations… so, we ‘bamboo’ rafted down the Li with some nice Chinese girls, Joy and Freya instead. Disappointingly, the boat was actually fibreglass… the modern world does have a habit of creeping in to ruin my ideals; never mind. Freya and Joy very kindly gave me a flower crown to match theirs and some Pomelo (a fruit) – I am converted. Then we headed off to Xingping – cute town, not much to do, but some nice views – and then Yangshuo – touristy, but lots of nice restaurants and bars – before taking our leave of the girls and heading back to Guilin for dinner. Xingping had a lots of little alley ways & non touristy shops… not quite real China but not far, where-as Yangshuo was built for the tourists… I think a place maybe to base yourself from & head out into the countryside. 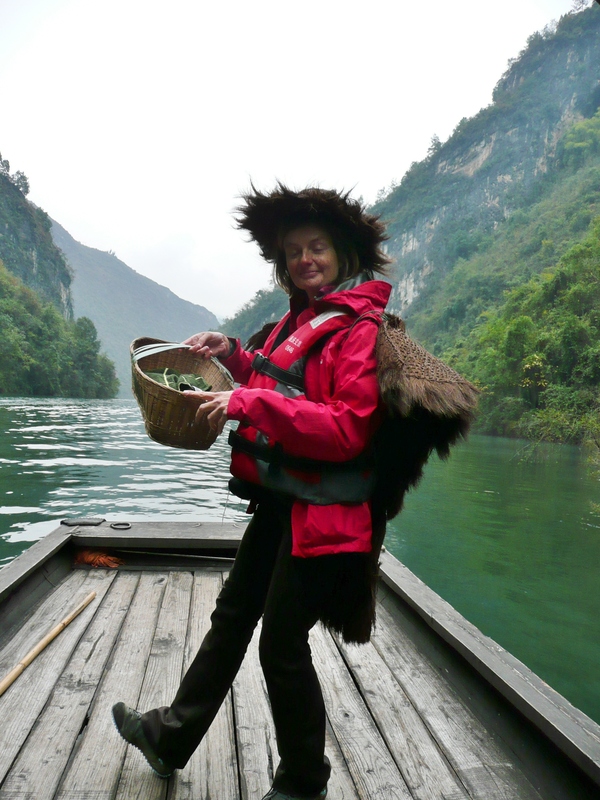 Another organised trip today (I don’t really like them, but it is impossible to do in a day otherwise and since I met Swedish Jenny in Guatemala who told me that the rice terraces in Guilin were her favourite place in China, we HAD to go). So, the downside was that we were tied to the tour schedule, roped into doing some stuff we didn’t really want to do, and then only had a 20 minute walk up to view the recently harvested rice terraces. I had thought we were walking in the terraces for a couple of hours from the tour description, but no. Also the terraces had been harvested on October 1st so were not as stunning as they would have been (we were prepared for this). It was still nice, and we met more nice people, but it was not really worth the price of the trip. 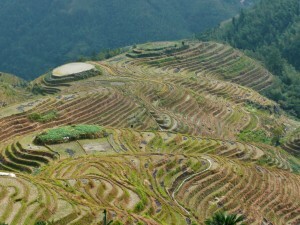 We will have to try rice terraces elsewhere, I suspect. 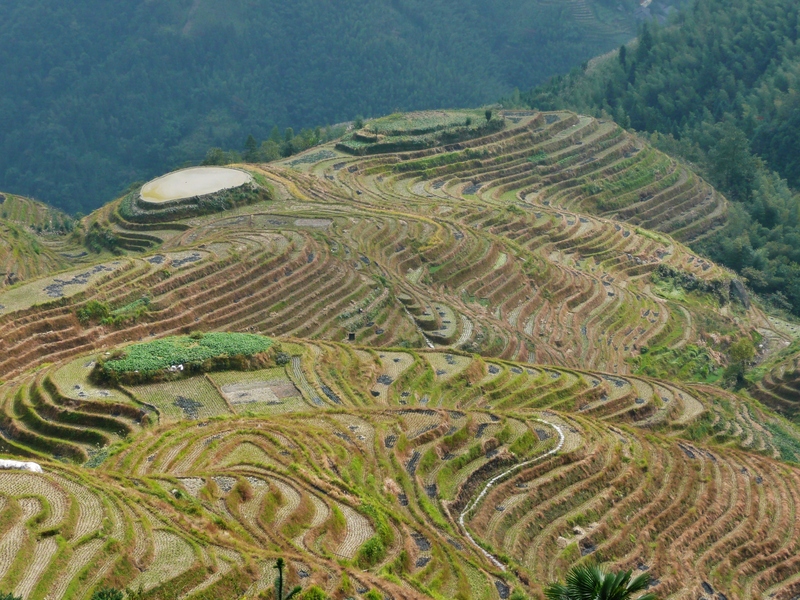 We knew the rice terraces weren’t at their best – neither wet & shimmering nor golden & ready to harvest – however, glad we went to see them (if only for the exercise in climbing yup to view them & back down). 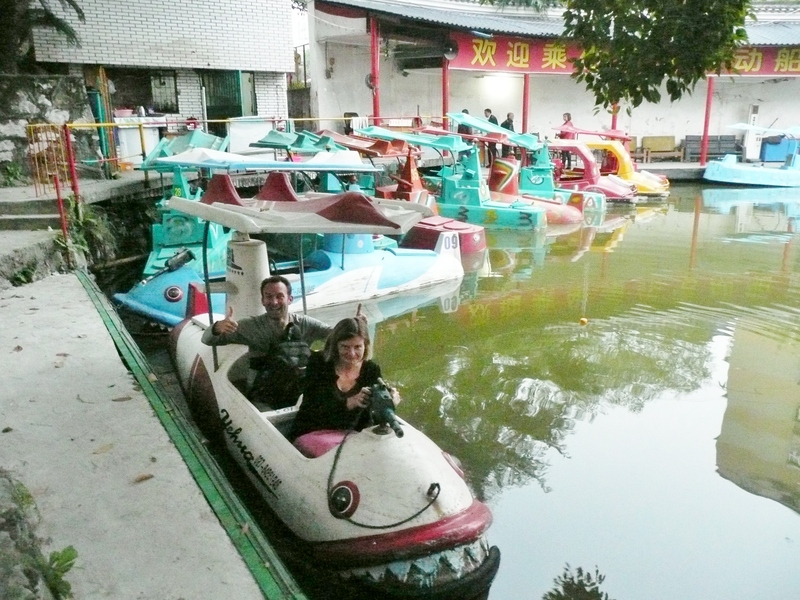 Had a manic run around frantically trying to find the supermarket to buy supplies for our 3 Gorges cruise; apparently we won’t like the Chinese food – possibly more bits of animal that no Westerner normally eats for Keir, and a choice of meat for me! A day of travelling to catch up with the boat & cruise down the Yangtze. Arrived on board & they tried to put us in a 6 berth cabin when we paid for a 4 berth (a bit of economising). Fortunately, they didn’t realise who they were dealing with… T soon put them right on that one & we were given a 4 berth cabin… on our own – result! It became even more of a result when we realised that we were the only Guilos on board… the Chinese treated us like celebrities! The boat was late in leaving & we ignored the first stop that night. Decided to give the first trip of the day a miss as it did not sound that exciting, and ventured out. A few gangplanks and hulking old ships later, we found our breakfast; not wanting to be accused of non-adventurousness, I decided it was time to trust to my Mandarin phrases for what I did and did not eat and trust to the chance of a Chinese breakfast. I THINK it was congee, though it just seemed like undrained rice with some yellow stuff, and a couple of (I hope) tea boiled eggs. Keir went for full-on beef dumpling noodles – at 8:30am?!? Back on the boat and we passed through the first gorge, Qutang, pretty, but the weather is so misty that we are definitely not seeing it at its best. The 3 lesser gorges were beautiful, but again the weather slightly impaired the experience; still, at least it was not raining. Fortunately I happened to meet the only guest on the boat who spoke English, who conveniently translated that we needed to disembark boat number 1 for a smaller boat - god only knows where we would have ended up otherwise – where we were treated to singing boatmen and music from the houses built into the sides of the gorge, nice. 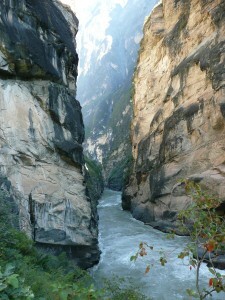 3 Little Gorges trip was great fun – T even had a go at the ‘dodgy outfit’ photo – & beautiful at the same time. V impressive. Emboldened by my non-disastrous breakfast this morning, we even risked the Chinese food on the boat, it was pretty good, though the boat restaurant seemed to subscribe to the same insane need for fresh air that I have been constantly subjected to in China – it doesn’t seem to matter that it is about 9 degrees outside! Attempted to get up for the optional excursion this morning, but they seem to have made it earlier than suggested in our itinerary, and as we cannot understand a word of the announcements, we missed it. Still, the sun has come out today and it is glorious! More fibre glass ‘dragon’ boats – wasn’t too bothered about missing this one. 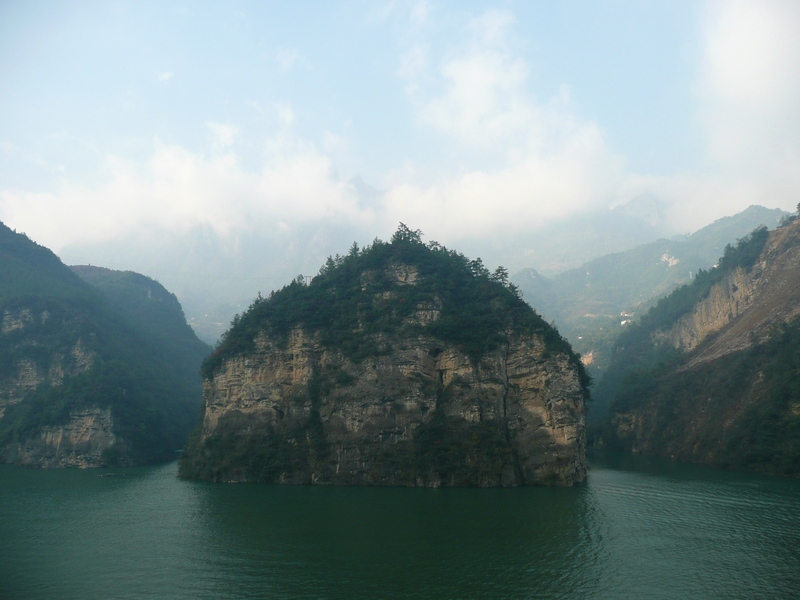 I was disappointed with the 3 Gorges cruise – bit of an adventure but the gorges weren’t that impressive & there were a lot if industrial works along the banks. If anyone asked me I’d say give it a miss. Arrived back in Chongqing with about 5 hours to kill – the hard sleeper was not too bad with ear plugs, though the beds did seem strangely narrow and I had to insist on some clean bedding – clearly my face said what my mouth could not – and after a protracted breakfast we decided we had little time for anything other than photos, admin and a quick electric submarine ride (with guns that caused some of the targets to squirt water!) before the flight to Lijiang that afternoon. Killing time catching up with mail, photos & T organising the next leg of the trip. Arrived in Lijiang & it took us 3 attempts to find a taxi to take us anywhere near our hostel… even then we had to rely on my Nokia drive app (again) to find our bed for the night as the taxis aren’t allowed in the old town. 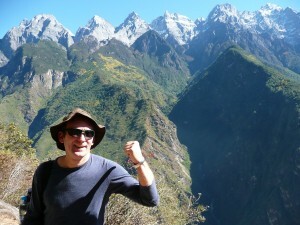 Up early for our transport to Tiger Leaping gorge. It is a beautiful day and we have a 5 hour walk, with 28 bends on the ascent apparently :?, these were tough, but we were pleased to see, that lack of fitness notwithstanding, we still seemed to be able to walk faster than our younger fellow hikers, and this is with my frequent photo-stops, of course. The gorge is just stunning, a lovely walk. Arrived at our destination point for dinner (the Halfway Guest House – ingeniously named as, you guessed it, it’s half way along the trek) to be met by the most disinterested staff ever. The only plus point was that the view from the khazi was as beautiful as the Lonely Planet & Michael Palin described it to be! So we had a quick drink & headed 5 mins up the road to our, quote, unquote, ‘family run, friendly guesthouse’… Obviously a triumph of marketing over substance. Any family presence had long since disappeared & a couple of young boys now managed the place… very badly – nothing clean & nothing on the menu (apart from Pumpkin!). Tracey, not surprisingly, refused to take the first room we were shown (dead bugs in the bedding) but, as we were the only ones there we had the choice of rooms. So, a quick shower & back to the disinterested hostel for dinner. Cool, final touristy day in China; amazed to find our place had hot water in the morning & had a breakfast whilst various wildlife (including a ‘kid’ – of the baby goat variety!) gambolled around in the courtyard. The hike down to Tina’s Guesthouse (where we we’re picking up our transport) was a bit of a killer, but the vertical climb down to the gorge & back up was worse. Vertical steps cut into the cliff face. T obviously had a show off & use the rickety ladder partially down the cliff face. Discretion being the better part of valour, I decided to take the steps! The young French couple we’d met at the top had said that it was very dangerous & took an hour to get down, 1.5hrs to get back up… took us 1 hr 20 mins inc. sightseeing… there’s still life in the old dogs yet! (oops, hope T doesn’t read this; I may be in trouble for that metaphor!). Loved the gorge; really dramatic, wonderful scenery & waterfalls… lots of dangerous drops & scarily narrow paths… Health & Safety be damned!! Found a lovely hostel, I think it was called Secret Garden or similar – aptly named as it was hard to find – in which to while away the afternoon eating, drinking and booking a last minute flight out of Thailand so that we could get the visa on arrival… before hasty meal and another late dash to the airport – thankfully they even close the international flights 40 minutes before departure, I was sure we would come unstuck this time. Left our bags at the airport in the morning for an evening flight & still nearly missed it… idiots! Still, afternoon was v chilled & we got a lot done. T was the happiest I’d seen her for a while in the night market – we actually had something to buy & she could shop for Britain… & she did! She was actually looking for a new pair of flip flops but when I saw some bright red, rubber sandals…. She HAD to have them! Hostel was v nice – we had a little chalet around the central pond, but the other residents were a bit rowdy late into the night until T gave them a piece of her mind!